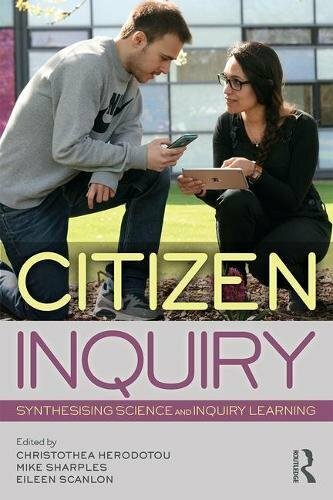 Citizen Inquiry is a new book, edited by Christothea (Thea) Herodotou,‎ Mike Sharples, and Eileen Scanlon – all are education technology experts at the Open University. To celebrate the book, the Institute of Education Technology organised a citizen science impact symposium. These are my notes from the day. 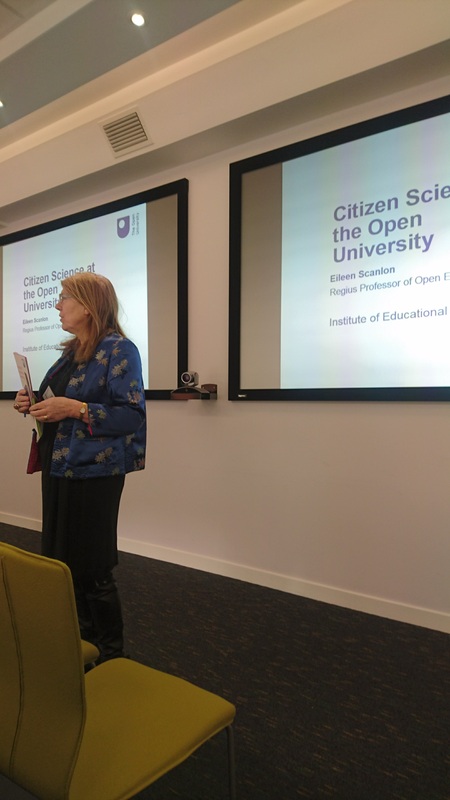 The day opened with Eileen Scanlon covered Citizen Science at the Open University. Eileen provided context about the role of the Open University in providing an alternative way of learning science. Concepts about teaching science and how to understand the experience of the learner. There is a series of innovating pedagogy reports – the 2017 report will come out soon. Eileen examined how the introduction of technology change science learning and teaching. Technology should be understood more widely: development of experimental kits that were created to allow students to explore science at home, with thousands of students joining in the 1970s. The OU has used television as a way of linking learning to the courses that they lead, and today they link to other popular programmes, with a lot of interactions on the web and using online technology. They’ve done the SO2 pollution national experiment from 1971-1979 with acknowledgement to the contribution of the volunteers in a paper by Rose and Peare 1972 (p378). The work involves teaching science in a social experiment and carried out with first-year students. Further work was carried out by Peggy Varley – drosophila that were captured in matchboxes with insects. Later versions of the introductory course included moths traps. The aim was to engage students with science. In 2007-2009 another activity at the OU is iSpot that focused on geographical aspects of species distribution and developed by Jonathan Silvertown. The OpenScienceLab is to open science to people across the spectrum of learning. There is a journey between informal and formal learning and can travel in both directions (e.g. iSpot evolved into supporting a MOOC in ecology). There are massive challenges for new learning – informal to formal, passive to active, solitary to sharing and from learner to teachers. I was asked to provide a keynote, and provided a talk about learning in contributory, collegial and co-created citizen science, drawing especially on the experience of the ExCiteS group. The next presentation was by Thea Herodotou about the LEARN Citsci: a project that involved UCDavis, OU, Oxford, NHM, CalAdacmey and LA County. The project is looking at citizen science and focuses on youth participants (5-19) and the learning outcomes – what they learn through participation. There are multiple overlapping settings – how the goals help and hinder their learning. The project looks specifically at NHMs and the citsci projects that they’re doing. They look at Basu and Barton Citizen Science Agency which was adapted by Heidi Ballard. The objective of the project, in particular, the OU, trying to describe the learning settings where citizen science takes place – describe the physical or digital space where it’s happening, what are the roles of young people in projects, and also social interaction, family communication, staff, scientists etc. Looking at relevant activities – one day. They examine iNaturalist application in a bioblitz and the way it is used. They also examine Zooniverse and looking at NHM project – miniature fossils that are being used in the project. In year 1 the focus is on describing settings, and then move to capture learning, then redesign new citizen science programmes and then data analysis. The intended impacts include how to design online and offline citizen science programmes to scaffold learning and participation for young people. The final morning talk was by Liz FitzGerald – about Situ8 – a tool to let annotate physical places with digital information, it is now a web platform. A hub for Geolocated media, originally created as a generic platform. Situ8 was with limited resources and initial prototype as a smartphone app and became a web portal. Allow people to register and by anyone. Used it in an OU field course, and in S288 module for Practical science – with measures of water quality. The platforms support data, images, text, video. They also allow exploring the data that was collected. Supports both qualitative data collection (poems or recording of information) and scientific data. They are addressing the copyright of the data and control over the downloading permissions. They use MO – Media Objects – and the platform is very generic. Mike Sharples – talked about nQuire – the original version, which provided a tool for schools to developed and get involved in inquiry-based learning in schools. Open learning allow for sophisticated exploration, including the virtual microscope at the OU that allows the exploration of moon rocks. The system doesn’t work due to changes in technology. The OU approach is starting from mobile and inquiry-based learning, and how to engage citizens and a wider range of participants. The successes include “citizen inquiry” as a proposal which became a reality (originally mention in an ERC synergy proposal that wasn’t successful). Citizen inquiry is becoming a framework that is recognised that combines with citizen science and inquiry-based ideas. They also developed tools – the nQuire platform, supported by Nominet Trust. The nQuire0t platform is a more open activity which includes spot-it, sense-it and win-it missions. They have 1106 users and 187 projects. The nQuire-it platform is supported by an app that unlocks the sensors on the mobile phone that the system opens to a user. Challenge – how to get to the mass scale that is beyond surveying. There are issues of recruitment, think of engagement – such as a low barrier to entry and intimidating to newcomers. The introductory screen of many websites assumes existing interest. Also how to gain value from contributing positive feedback, join a community of practice (in future learn). The next issue is sustainability – how to keep a community going: identity (we’re rock hunters/cloud spotters), development – is there a sequence of forming, storming, norming, performing relevant to cit sci, and what guidance, curation and mentoring. Finally Maturity, including considering the maturity of a community and its mitosis (breaking up to new group). Need to thing of places for people to interact with each other, support each other. The third challenge is how to do good science with valuable outcomes that is appropriate, reliable, robust and ethical. Good citizen inquiry need to do valuable learning, linked to teaching, have a large scale data set, good element of engagement and serendipity, involvement of trained scientists and accurate data collection and analysis. Gill Clough talked about geocaching about the use of geocaching then and now – she done a study in 2007. She done a detailed mixed survey of closed and open questions, and she discovered a lot of learning – 84% learn something online. Geocaching have become a subscription app, not expensive, and the commercialisation led to debate in the community. GPS is also available on the phone, and it is relying on them. Stuart Dunn and Mark Hedges look at citizen humanities and transmission of knowledge. Looked at crowdsourcing in humanities projects http://www.ahrc.ac.uk/documents/project-reports-and-reviews/connected-communities/crowd-sourcing-in-the-humanities/ notice different types of projects that are close to the classical crowdsourcing. Crowd gets methodological proficiency, domain expertise about the subject – but outside universities. They also identified collective knowledge and practical skills.